MONTREAL -- Air Canada and Chorus Aviation Inc. have extended a purchase agreement by 10 years that will see Chorus subsidiary Jazz Aviation LP continue to provide Canada's biggest airline with regional service through to 2035. The deal quelled concerns about Chorus's future after Air Canada announced last February it would expand its Rouge fleet and fly the lower-cost airplanes on Canadian regional routes -- Jazz's traditional territory. The agreement Monday tacks on another $940 million in aircraft leasing income and fixed fees flowing to Chorus over the next 17 years, swelling the revised contract's worth to $2.5 billion in total, the holding company said. Both companies characterized the deal as a "win-win." 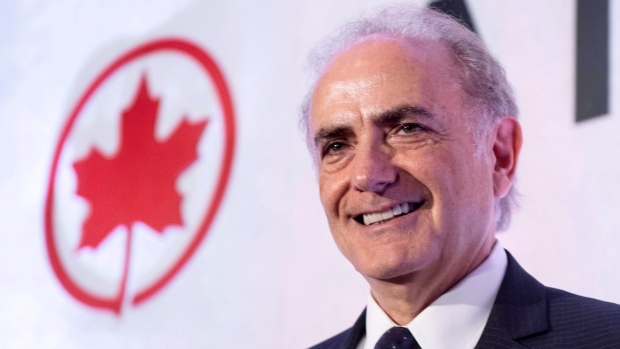 Air Canada chief executive Calin Rovinescu said the contract offers his company long-term stability, cost certainty and "the flexibility to modernize the regional fleet for the benefit of our customers." Chorus CEO Joe Randell, who helped launch Jazz in 2002 -- then still a branch of Air Canada -- acknowledged the unease over the previous agreement's expiry date in 2025. "There has been some concern about where does Jazz sit in Air Canada's plans and how long is this relationship going to last," Randell said on a conference call with investors. "This really puts those concerns to bed." Investors cheered the deal and sent shares of Halifax-based Chorus up 15 per cent to close at $7.24. Under the new agreement, Air Canada will make an investment of $97.3 million in Chorus, giving the airline about 10 per cent of Chorus's class A and class B voting shares, cumulatively. Air Canada is committed to lease 105 aircraft annually from now through 2026, and at least 80 aircraft in the 75-to-78 seat range each year from 2026 through 2035, according to Chorus. Those leases will yield $1.6 billion in revenues, nearly two-thirds of the contract's worth going forward. Analyst Walter Spracklin of RBC Dominion Securities called the announcement "very positive" and said the agreement "should be very well received." "The most important element of the new CPA is the 10-year extension to 2035, as it meaningfully reduces the potential 'cliff risk' of an unextended CPA," he said in a note to investors. Cameron Doerksen, an analyst with National Bank Financial, stressed "certainty and predictability" for the two companies and their investors. The amended deal installs "guardrails" so that the fees -- while lower than originally contracted over the next two years -- shift within a range of plus or minus $2 million yearly, ensuring more predictability, Chorus said. The fee total will add up to about $858 million.